A quick-thinking man caught a baby thrown from the "ninth or the tenth floor" window of a building by a desperate woman after a huge fire engulfed the 24-storey residential tower block in London. The fire at Grenfell Tower on the Lancaster West Estate in Latimer Road was reported at 1.16 local time. 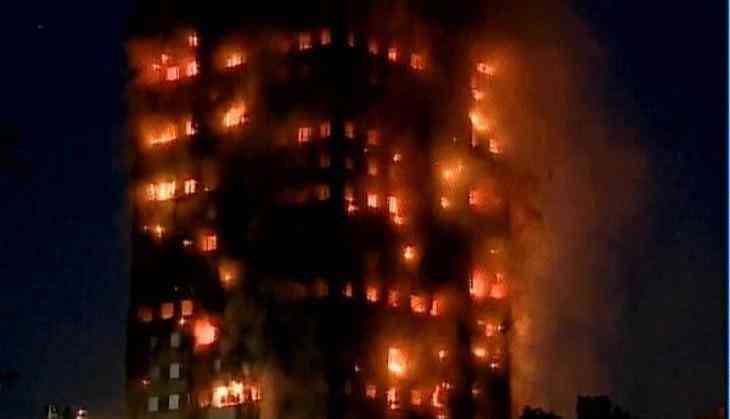 About 600 people were believed to have been inside the tower's 120 flats when the blaze ripped through the building. Samira Lamrani, a witness, was quoted by The Telegraph as saying that she saw a woman try to save a baby by dropping it from a window "on the ninth or 10th floor" to waiting members of the public below. "People were starting to appear at the windows, frantically banging and screaming," she said. The windows were slightly ajar, a woman was gesturing that she was about to throw her baby and if somebody could catch her baby. "Somebody did, a gentleman ran forward and managed to grab the baby," she said. "I could see people from all angles, banging and screaming for help. Us members of the public were reassuring them, telling them we've done what we can and that we've phoned 999, but obviously the look on their face was death," Lamrani said. At least six persons were killed and over 50 others injured in the massive fire, with police expecting the death toll to rise. "My daughter's friend said she observed an adult who made some sort of homemade parachute and tried to lower himself out of the window," Lamrani said. "The more I looked up, floor upon floor. Endless numbers of people. Mainly the kids, because obviously their voices, with their high pitched voices -- that will remain with me for a long time. I could hear them screaming for their lives," she said. She told LBC, "One woman actually threw her son out of the window. I think he's OK. I think he might have just had some broken bones and bruises.